Little Barborka has just started to learn how to solve a picture puzzle. She has started with a small one containing 15 pieces. Her daddy tries to solve the puzzle too. To make it a little bit harder for himself, he has turned all puzzle pieces upside down so that he cannot see pictures on the pieces. Now he is looking for a solution of the puzzle. Normally the solution should exist but he is not sure whether Barborka has not replaced some pieces of the puzzle by pieces of another similar puzzle. Help him and write a program which reads a description of a set of puzzle pieces and decides whether it is possible to assembly the pieces into a rectangle with given side lengths or not. there is one cavity in the middle of the side. 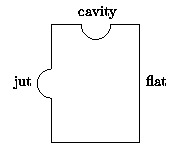 As is usual, two pieces can be placed side by side only if one has a jut and the other has a cavity on corresponding sides. We will denote the flat sides by F, the sides with juts by O and the sides with cavities by I. Each piece is described by four letters characterizing its top, right, bottom, and left side. To make the task easier the pieces can be used only as they are described i.e. they cannot be turned. After each block there is an empty line. The last block consists of just one line containing 0 0, i.e. two zeros separated by one space. The output contains the lines corresponding to the blocks in the input. A line contains YES if the corresponding block in the input describes a puzzle that can be correctly assembled. Otherwise it contains NO. There is no line in the output corresponding to the last ``null'' block of the input.